Old Bollywood poster of the longest running film in Indian cinema, Dilwale Dulhania Le Jayenge (1995) for sale. Featured here for sale is a poster of the iconic 1995 film Dilwale Dulhania Le Jayenge (DDLJ) directed by débutante director Aditya Chopra starring superstar Shahrukh Khan (SRK) along with Kajol in lead roles. Dilwale Dulhania Le Jayenge (DDLJ) is an all-time blockbuster and remains the longest running film in the history of Indian cinema. In 2014, the film completed a milestone of 1000 weeks at the Maratha Mandir theatre in Mumbai – a full 20 years after its first release! DDLJ’s epic success has ensured it continues to find a place on the “Movies You Must See Before You Die” list, making this Dilwale Dulhania Le Jayenge movie poster, highly collectible! 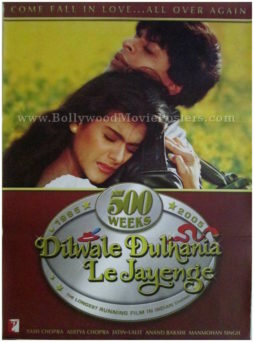 Printed and circulated to commemorate the film’s historic milestone of completing 500 weeks in 2005, this Dilwale Dulhania Le Jayenge movie poster was originally designed and printed for publicity of the film but never ended up being used. Shahrukh Khan (SRK) and Kajol are seen in a passionate embrace in this Dilwale Dulhania Le Jayenge poster. This SRK and Kajol picture has reached cult status over the years and is instantly recognizable today as a memorable still from the film. Dilwale Dulhania Le Jayenge (DDLJ) is considered as one of the biggest Bollywood hits ever made in Indian cinema. It boasts of 10 Filmfare Awards, the most ever won by a single film at the time as well as a National Film Award. Produced by the King of Bollywood romance Yash Chopra, DDLJ was released on the 25th anniversary (silver jubilee) of Yash Raj Films. 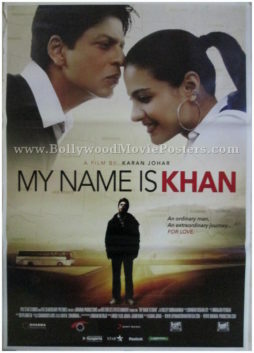 Bollywood poster of the blockbuster Hindi film My Name Is Khan (2010) for sale. This is an actual surviving Shahrukh Khan poster of the 2010 Hindi film My Name Is Khan that featured the “King of Bollywood” in the lead role opposite actress Kajol. Directed by Karan Johar, My Name Is Khan was distributed by FOX Star Entertainment. FOX purchased the rights for the film for a whopping 1 billion rupees, making it one of the most expensive distribution deals in the history of Indian cinema in the year 2010. My Name Is Khan reunited Bollywood's most successful couple, Shahrukh Khan and Kajol after a gap of nearly a decade. The two had last appeared together in Kabhi Khushi Kabhie Gham in 2001. Upon its release, the film broke many box office records. My Name Is Khan was the highest-grossing Bollywood film overseas at the time of its release, making this Shahrukh Khan poster, highly collectible! Printed and circulated during the first release run of the film, this glossy My Name Is Khan poster was originally designed for publicity of the film but never ended up being used. Shahrukh Khan and Kajol are seen in a close up on the top of this My Name Is Khan poster. An iconic still photograph of Shah Rukh Khan standing near a freeway is seen at the bottom. A message at the bottom of this My Name Is Khan poster reads, “An ordinary man, An extraordinary journey … for love.” The poster is set against the backdrop of a faintly visible map of the United States of America. My Name Is Khan was promoted in a manner previously unseen for an Indian film. It was screened as part of the 60th Berlin International Film Festival's Official Selection in February 2010. Tickets for the film's screening at the festival reportedly fetched record prices of £1,000 GBP each, selling out completely in seconds. In February 2010, Shah Rukh Khan and Kajol became the first Indian movie stars to ring the opening bell of the New York stock exchange NASDAQ. My Name Is Khan broke the four-year record of Kabhi Alvida Naa Kehna (KANK), and became the highest grossing Bollywood film in the UK. The film received numerous awards including Best Director (Karan Johar), Best Actor (Shahrukh Khan) and Best Actress (Kajol) at the 2011 Filmfare Awards. The soundtrack of the film became a rage throughout the nation. Songs like “Tere Naina” are fondly remembered and played till today. Shahrukh Khan poster of the blockbuster Hindi movie My Name Is Khan (2010) for sale. This is an actual surviving Shahrukh Khan poster of the 2010 Hindi movie My Name Is Khan that featured the “King of Bollywood” in the lead role opposite actress Kajol. Kuch Kuch Hota Hai swept all major categories at the 1999 Filmfare Awards, becoming the third Indian film to win all four major awards (Best Film, Best Director, Best Actor and Best Actress) at Filmfare, making this Shahrukh Khan poster, highly collectible! Printed and circulated somewhere in the late 1990s, this glossy Kuch Kuch Hota Hai movie poster was originally designed for publicity of the film but never ended up being used. 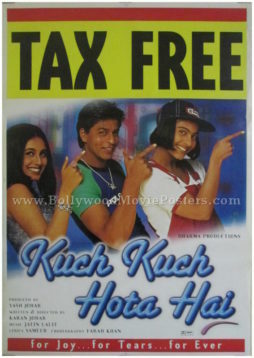 Shah Rukh Khan, Kajol and Rani Mukerji are seen on the top of this KKHH poster in a black and white still photograph taken from the movie. An iconic still photograph of Shah Rukh Khan and Kajol dressed in sports gear is seen at the bottom of this Kuch Kuch Hota Hai poster. Bollywood poster for sale of the longest running film in Indian cinema, Dilwale Dulhania Le Jayenge (1995). 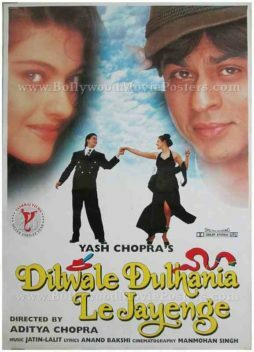 DDLJ’s epic success has ensured it continues to find a place on the “Movies You Must See Before You Die” list, making this DDLJ movie poster, highly collectible! Printed and circulated nearly two decades after the first release of the film (2000s), this Dilwale Dulhania Le Jayenge movie poster was originally designed and printed for publicity of a more recent screening of the film but never ended up being used. 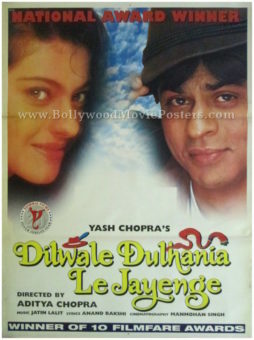 Old Bollywood poster for sale of the longest running film in Indian cinema, Dilwale Dulhania Le Jayenge (1995). This is an actual surviving poster for sale of the iconic 1995 film DDLJ directed by débutante director Aditya Chopra starring superstar Shahrukh Khan (SRK) along with Kajol in lead roles. Printed and circulated a few years after the first release of the film (late 1990s), this Dilwale Dulhania Le Jayenge poster was originally designed for publicity of the film but never ended up being used. This Dilwale Dulhania Le Jayenge movie poster features close ups of Kajol and Shahrukh Khan (SRK) prominently. A blue sky background is seen in this DDLJ poster set in Switzerland. Dilwale Dulhania Le Jayenge (DDLJ) is considered as one of the biggest Bollywood hits ever made in Indian cinema. It boasts of 10 Filmfare Awards, the most ever won by a single film at the time as well as a National Film Award. The poster capitalizes on the epic success of the film by declaring it a “National Award Winner” on the top and a “Winner of 10 Filmfare Awards” at the bottom. Dilwale Dulhania Le Jayenge (DDLJ) is a 1995 romantic Bollywood movie produced by the King of Bollywood romance, Yash Chopra and directed by his son Aditya Chopra. The film stars superstar Shah Rukh Khan and Kajol in lead roles. Classic Bollywood film poster of the blockbuster old Hindi movie Karan Arjun (1995) for sale. This is an actual surviving old Bollywood poster of the 1995 classic Hindi film that featured two of the biggest superstars of Bollywood Shahrukh Khan and Salman Khan together on screen. Karan Arjun was the second biggest hit of 1995 after Dilwale Dulhania Le Jayenge and starred the King Khans of Bollywood together, making this classic Bollywood poster highly collectible! 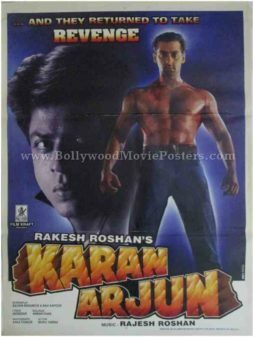 Printed and circulated during the initial first release of the film (somewhere in the mid 1990s), this Karan Arjun movie poster was originally designed for publicity of the film but never ended up being used. Karan Arjun was directed by Rakesh Roshan and featured Raakhee, Amrish Puri, Kajol, Mamta Kulkarni and Johny Lever in prominent roles in addition to the two King Khans who played the lead roles in the film. Actor Hrithik Roshan was the assistant director of Karan Arjun – his first major contribution to Bollywood. The music and background score was composed by Rajesh Roshan. Songs from the film such as “Jaati Hoon Mein Jaldi Hai Kya” and “Yeh Bandhan to Pyar Ka Bandhan Hai” became instant hits and are still played today. Original Dilwale Dulhania Le Jayenge (1995) movie poster for sale. This is an actual surviving original movie poster of the longest running film in Indian cinema Dilwale Dulhania Le Jayenge (DDLJ)! Produced by the King of Bollywood romance, Yash Chopra and directed by his son, debutante director Aditya Chopra, the film starred superstar Shahrukh Khan (SRK) and Kajol in lead roles. Printed and circulated in the early 2000s, this Dilwale Dulhania Le Jayenge movie poster was originally designed for publicity of the film but never ended up being used. Dilwale Dulhania Le Jayenge (DDLJ) is an all-time blockbuster and remains the longest running film in the history of Indian cinema. In 2014, the film completed a milestone of 1000 weeks at the Maratha Mandir theatre in Mumbai – a full 20 years after its first release! DDLJ’s epic success has ensured it continues to find a place on the “Movies You Must See Before You Die” list, making this poster, highly collectible! This photographic Dilwale Dulhania Le Jayenge movie poster has been printed on glossy paper. The poster features an iconic photograph of Shahrukh Khan (SRK) carrying Kajol over his shoulders. Dilwale Dulhania Le Jayenge (DDLJ) is considered as one of the biggest Bollywood hits ever made in Indian cinema. It boasts of 10 Filmfare Awards, the most ever won for a single film at the time as well as a National Film Award. Classic Hindi movie poster of the blockbuster Bollywood film Gupt (1997) for sale. This is an actual surviving classic Indian film poster of the 1997 Hindi murder mystery movie that starred Bobby Deol, Manisha Koirala & Kajol in lead roles. Printed and circulated during the initial release run of the film (somewhere in the late 1990s), this Gupt movie poster was designed for publicity of the film but never ended up being used. Manisha Koirala is seen in a stunning photograph prominently in the center. Large monochrome faces of Bobby Deol and Kajol are seen flanking her sides. The dark theme of this classic Hindi movie poster suggests the thriller genre of the film. The film is remembered for its amazing soundtrack composed by Viju Shah, which won the Filmfare Best Background Score award. Songs like “Mushkil Bada Yeh Pyaar Hai,” “Duniya Haseeno Ka Mela” and the title track “Gupt Gupt” are fondly remembered till date. Classic Bollywood movie poster of the blockbuster Hindi film Pyaar Kiya To Darna Kya (1998) for sale. This is an actual surviving classic Bollywood film poster of the Hindi movie released in the year 1998 that featured the “Box Office King” of Bollywood, superstar Salman Khan in the lead role opposite actress Kajol. A song from the film, “O O Jaane Jana,” picturized on a shirtless Salman Khan wearing only his denims, became a rage throughout the nation. The massive success of the song and the film catapulted Salman Khan to super stardom, turning him into the heartthrob of the nation, making this Salman Khan movie poster highly collectible! Printed and circulated during the first release of the film (somewhere in the late 1990s), this Salman Khan poster for sale was originally designed for publicity of the film but never ended up being used. This old Salman Khan poster features a stunning large photographic still of actress Kajol. A smaller still of Salman Khan showing off his perfect abs appears alongside. The chart topping hit song from the film, “O O Jaane Jana” sung by Kamaal Khan bagged the Filmfare Award for Most Popular Song and is fondly remembered and played till today. 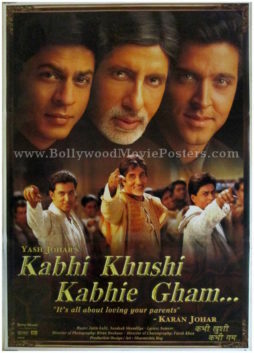 Classic Bollywood movie poster of the blockbuster Hindi film Kabhi Khushi Kabhie Gham (2001) for sale. 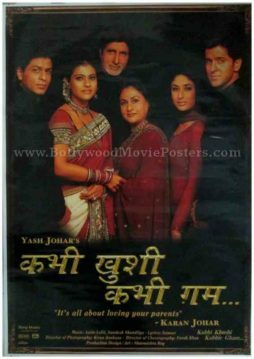 This is an actual surviving classic Bollywood film poster of the 2001 Hindi movie written and directed by Karan Johar that featured the “King of Bollywood,” superstar Shahrukh Khan in the lead role opposite actress Kajol. The film also starred the greatest actor in Indian cinema, superstar Amitabh Bachchan along with Jaya Bhaduri Bachchan, Hrithik Roshan and Kareena Kapoor in prominent roles. Kabhi Khushi Kabhie Gham (sometimes also abbreviated as KKKG or K3G) holds the distinction of being the first Indian film to be given a theatrical release in Germany. The film was a massive success at the box office, breaking all opening records upon its release. K3G bagged five Filmfare Awards and is counted as one of the highest grossing Indian films in the overseas market, making this old Shahrukh Khan poster, highly collectible! The soundtrack of the film became a rage throughout the nation. Songs like “Kabhi Khushi Kabhie Gham,” “Bole Chudiyan,” “You Are My Soniya,” “Say Shava Shava” are played till today. 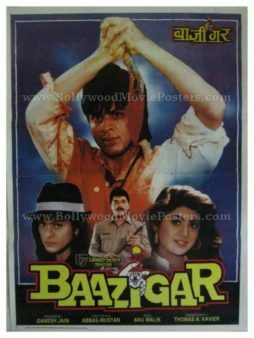 Classic Bollywood movie poster of the blockbuster Hindi film Baazigar (1993) for sale. This is an actual surviving classic Bollywood film poster of the 1993 Hindi movie that featured the “King of Bollywood,” superstar Shahrukh Khan in the lead role opposite actress Kajol. Baazigar marked a number of firsts. It was Shahrukh Khan's first role as sole lead; Kajol's first commercial success; first film to star the hit duo of Shahrukh Khan and Kajol; Shilpa Shetty's acting debut; Shahrukh Khan's first role as antihero and Shahrukh Khan's first role that earned him the Filmfare Award for Best Actor. Baazigar was a major commercial success at the time of its release, making this old Shahrukh Khan poster, highly collectible! Printed and circulated a few years after the first release of the film (somewhere in the late 1990s), this Baazigar movie poster was originally designed for publicity of the film but never ended up being used. The soundtrack of the film became a rage throughout the nation. Songs like “Yeh Kaali Kaali Aankhein” are played till today. This is an actual surviving classic Bollywood film poster of the 1998 Hindi movie that featured the “King of Bollywood,” superstar Shahrukh Khan in the lead role opposite actress Kajol. Rani Mukerji and Salman Khan also starred in the film. Kuch Kuch Hota Hai starred the popular on-screen pair of Shah Rukh Khan & Kajol and marked the directorial debut of Karan Johar. The film was extremely successful in India and abroad, becoming the highest grossing Indian film of the year and the third highest grossing Indian film ever behind Hum Aapke Hain Koun..! and Dilwale Dulhania Le Jayenge. Kuch Kuch Hota Hai swept all major categories at the 1999 Filmfare Awards, becoming the third Indian film to win all four major awards (Best Film, Best Director, Best Actor and Best Actress) at Filmfare, making this old Shahrukh Khan poster, highly collectible! 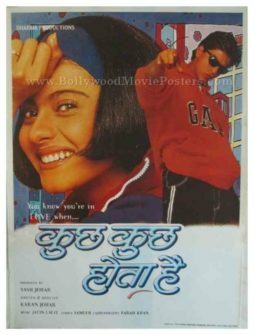 Printed and circulated somewhere in the late 1990s, this Kuch Kuch Hota Hai movie poster was originally designed for publicity of the film but never ended up being used. Original Bollywood poster of the longest running film in Indian cinema, Dilwale Dulhania Le Jayenge (1995) for sale. This is an actual surviving original Dulhania Le Jayenge movie poster of the 1995 film directed by debutante director Aditya Chopra starring superstar Shahrukh Khan (SRK) along with Kajol in lead roles. In 2001, Dilwale Dulhania Le Jayenge overtook Sholay (1975) as the longest-running film in Indian cinema. This original Dilwale Dulhania Le Jayenge movie poster was printed as a celebration of this milestone. The poster announces this record shattering event at the top, with the words “The longest running film in Indian cinema.” The tagline of the film, i.e. “Come fall in love” has been reworded to “Come fall in love, All over again” inline with the historic run of the film. This photographic Dilwale Dulhania Le Jayenge movie poster has been printed on thick stock glossy paper. The poster features an iconic photograph of Shahrukh Khan (SRK) carrying Kajol over his shoulders. This is an actual surviving original DDLJ poster of the 1995 film directed by debutante director Aditya Chopra starring superstar Shahrukh Khan (SRK) along with Kajol in lead roles. Dilwale Dulhania Le Jayenge (DDLJ) is an all-time blockbuster and remains the longest running film in the history of Indian cinema. In 2014, the film completed a milestone of 1000 weeks and continues to be played at the Maratha Mandir theatre in Mumbai – a full 20 years after its first release! DDLJ’s epic success has ensured it continues to find a place on the “Movies You Must See Before You Die” list, making this poster, highly collectible! Printed and circulated a few years after the first release of the film (Late 1990s), this old Dilwale Dulhania Le Jayenge poster was originally designed for publicity of the film but never ended up being used. This photographic Dilwale Dulhania Le Jayenge movie poster has been printed on thick stock glossy paper. Large close up photographs of Kajol and Shahrukh Khan (SRK) are seen on the top left and right respectively. A scene showing the lead couple dancing is pasted at the bottom of this DDLJ poster. A blue sky background is seen in this DDLJ poster set in Switzerland.